Both the reading from the prophet and the gospel reading for Epiphany 3C (Nehemiah 8:1-10 and Luke 4:14-21, respectively) are about...reading. Specifically public reading in the context of Jewish history, faith and life. In Nehemiah, Ezra reads aloud to the assembled people the book of the law of Moses. In the text from Luke, Jesus gathers with what is more than likely his "home" congregation and reads from the scroll of Isaiah, declaring the fulfillment of the prophetic text. Each week scripture is read aloud publicly in worship. In many Christian churches there is a lectern for the reading of scripture and a pulpit for preaching. Someone rather pointedly said that the lectern was for the inspired word of God while the pulpit was for the uninspired words of the preacher. The practice of reading from a table or desk comes to Christian worship from the Jewish reading desk from which Torah (and in the case of Isaiah, haftarah, aka haftorah) is read during services. The reading desk/table sits on the bimah, the raised platform that highlights scripture reading as the focus of the service. The desk enables the congregation and reader to see each another and facilitates the audibility of the reading. The style of the reading desk in a synagogue probably owes more to the fashion of the day and the architecture of the synagogue than anything else. Likewise, artists' interpretation of these passages probably tells us more about synagogues of their own day than those in the day of Jesus. 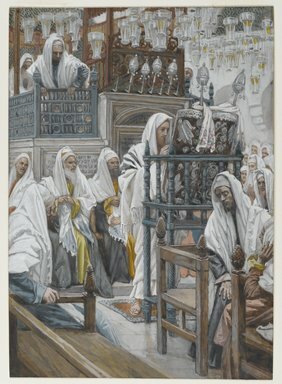 In Tissot's version of the story, the synagogue at Nazareth is quite ornate. 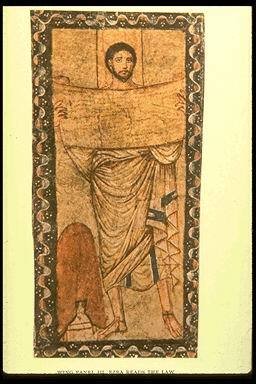 The scrolls from which Jesus is reading rest on a table designed to place the scroll at a comfortable reading height for a standing man and to provide a backrest for the tall scrolls. The table highlights the woodturner's art with turned legs on the bottom and turned spindles across the top rail. The scrolls are encased in ornate covers (mantels) and each wooden shaft (atzei chayim, trees of life) is crowned by a silver kesser. Is this how you pictured Jesus' hometown synagogue? Wooden tables don't survive from Jesus' day, of course. But we have clues to first-century synagogue design in the excavated city of Dura Europos, Syria. * Among the wall paintings in the synagogue is a full-length figure of Ezra reading the scroll of the book of the law. There is no reading desk present, though "Sunday School" materials often give Ezra a desk in addition to the wooden platform on which the text says he stands. One tradition identifies Ezra's reading of the book of the law as the beginning of regular readings from the Torah. Some scholars also credit Ezra with inspiring the haftorah readings (from the prophets). Ezra Reading the Scroll. Synagogue, Dura-Europos, Syria. 224 CE. It is from the prophets that Jesus reads in Luke's gospel. The passage speaks of God's justice and freedom. It tells of good news and sight regained. It proclaims the year of the Lord's favor. Imagine, then, if the reading desk or pulpit is inaccessible for you as a reader. See how one congregation noted and addressed the reality of a reading desk that could be in itself a proclamation of good news and eyes opened, freedom for those who were captive and justice as God defines it. This article tells a story that may indicate that the year of the Lord's favor may not be as far away as we first thought. *Syria is still pretty far away from Jesus' hometown in the first century. 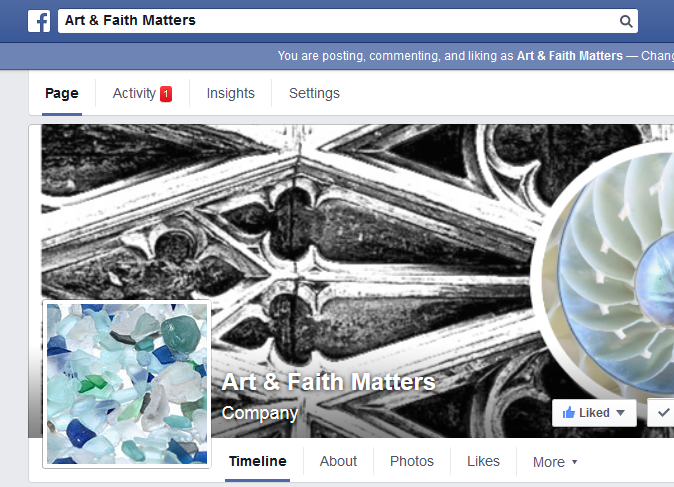 Art&Faith Matters' FB page has a link to an article about archaeology in the areas where Jesus lived. See what has been discovered recently.